Top of the world Mt. 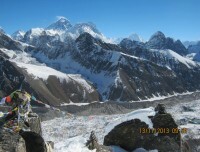 Everest views from Kala Pathar. Explore the land of Sherpas and get a glimpse of culture and traditions followed by local area people while trekking to the foot of the Mount Everest at about 8848meters. 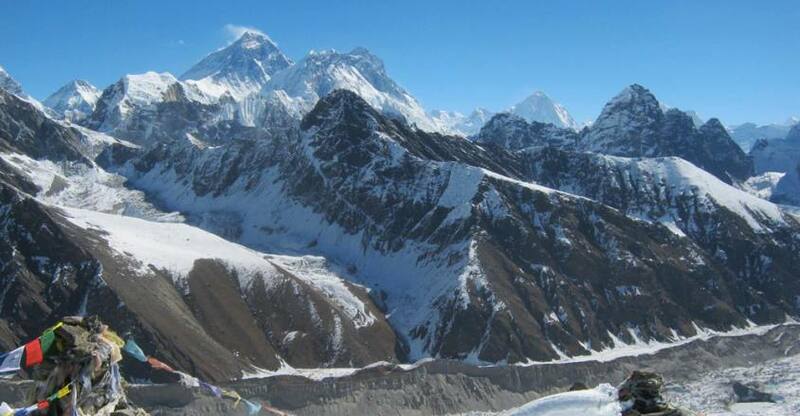 Also known Sagarmatha among Nepalese, Everest Base Camp trekking allows you to get the complete view of the almighty Mount Everest and other nearby snow-capped mountains. The best part of the trek is that it involves much more than only enjoying the panoramic views of the almighty Mount Everest. 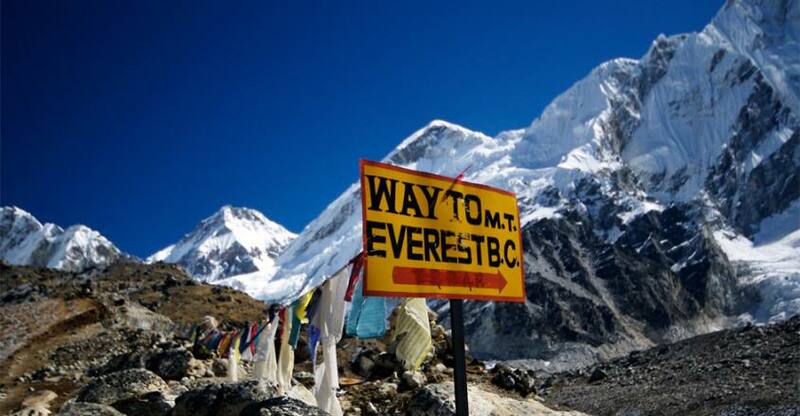 This is because; during your trek to Everest Base Camp, you will pass through the famous Khumbu Valley to soak yourself in the immense nature’s beauty of the Sagarmatha National Park and simultaneously, get breathtaking views of four worldwide highest peaks worldwide. 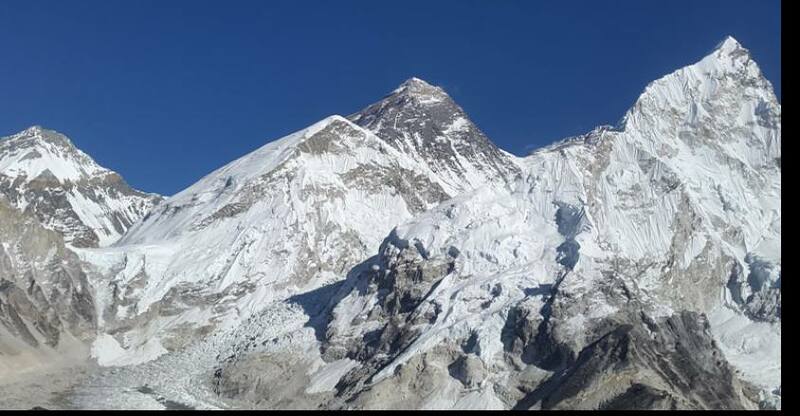 These include Mount Cho Oyu, Mount Makalu, Mount Lhotse, and Mount Everest. What would be better than retracing the footsteps of the worldwide renowned Sir Edmund Hillary and Tenzing Norgay while following the classic Everest Base Camp Trek and following other pioneers while moving towards the Base Camp from Lukla region. Do not forget to grab the opportunity to ascend the famous Kala Patthar at the height of about 5,500meters to witness many awe-inspiring views of the famous Mount Everest. Along with this, you will find here a large number of famous Buddhist monasteries placed dotted across the complete trail. Thus, your EBC trek allows you learning about the steep culture of the entire area in terms of its traditions and history related to different mountains lying on the complete Mount Everest region. Day 02: Fly to Lukla & Trek to Phakding 2652m.3/4 hours trek. Day 03: Trek to Namche 3440m. 5/6 hours trek. Day 06: Trek to Dingboche 4350m. 5/6 hours trek. Day 07: Rest day explore to the Chhukung 4710m. and back to Digboche.4410m. Day 08: Trek to Lobuche 4910m. 5/6 hours trek. Day 09: Trek to Everest Base Camp 5365m.then back to Gorak Shep 5181m. 7/8 hours trek. Day 10: Hike up to Kalapattar 5555m. early in the morning and trek down to Periche 4240m. 6/7 hours trek. Day 11: Trek to Namche 3450m.6/7 hours trek. Day 12: Trek to Phakding 2600m. 4/5 hours trek. Day 13: Trek to Lukla 2800m. 5/6 hours trek. Day 14: Fly back to Kathmandu 1350m. Land at Kathmandu Airport. Transfer to hotel by our tour representative. Relax. Overnight at Hotel. After breakfast, we take an early morning scenic flight to Lukla by a Helicopter. After landing at Lukla we start our trekking journey. The trek slowly starts by downhill towards Cheplung village from here appreciate the view of Mt. Khumbila, a holy mountain which has never been trekked. Then the trail descends again. Reach Phakding. Overnight at Lodge. After breakfast, we trek through a pine forest. Then the trail ascends to north through the Benkar valley. Crossing Dudh Koshi River as well as Chumoa and Monjo villages we arrive at the Everest National Park. From the park, we climb on a steep path enjoying the incredible views all around us. Reach Namche Bazaar. It is the largest town in the Everest district. Overnight at Lodge. Today spend the day to get acclimatized for further trekking journey. We can wander around Namche Bazaar and hike to Sagarmatha National Park. Here we appreciate the sunrise over the Himalayan ranges such as Mt. Everest, Nuptse, Lhotse, AmaDablam, Kongde, Thamserku etc. Then visit the monastery and Hillary School. Overnight at Lodge. Today our trail goes downhill to the Dudh-Koshi River. Enjoy the landscapes of mountain peaks like Mount Everest, Nuptse, Lhotse, AmaDablam, Kongde, Thamserku etc. Pass along the rhododendron forests reach Tengboche. Here we visit Tengboche Monastery, the biggest monastery in the region. Overnight at Lodge. After breakfast, the trail descends through lush forests of conifers, birch, and rhododendrons. Today also we trek surrounded by the great views of Mt. Everest, AmaDablam, and Lhotse. Then the route descends to Devuche. Cross the Imja River to arrive at Pangboche. The upper Pangboche route gifts us with a more natural view of the Himalayas and the Pangboche Monastery. Move further to the Imja Valley, Lobuche River and lastly, climb to reach Dingboche. Overnight at Lodge. Today again we spend the day to get acclimatized for the strenuous trek ahead. Here stroll in the beautiful village with a range of fields of barley, buckwheat, and potatoes. 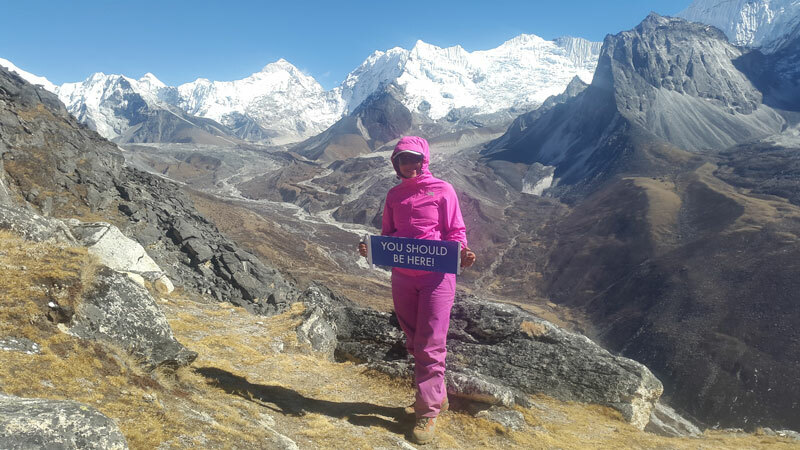 We can do day hikes to either Chukkhung Valley or Nagarjun Hill to experience amazing scenes of Makalu, Chalotse, Tawache, Lhotse, and AmaDablam. Overnight at Lodge. After breakfast, we begin the trail with a gradual ascent to Duglha. Then we ascend a steep path to ChupkiLhara surrounded with stones and prayer flags. Further, we proceed to the Khumbu Glacier moraine and witness several prominent peaks like Lingtren, Khumbutse, Pumori, and MahalangurHimal. 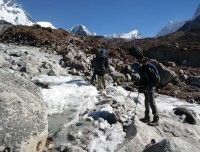 Then an easy trail takes us to Lobuche. Overnight at Lodge. Early morning, we begin the strenuous trek due to its tough high-altitude climate. Also, the trail today is complicated so we diligently follow our lead Sherpa. We trail via rocky dunes, rivers, and moraine. Finally, arrive at the Everest Base Camp. Upon reaching the base camp you will be stunned to view the magnificent environment with a panorama of Nuptse, Khumbuste, and Pumori. After spending some time here, we retrace the same route to reach back to GorakShep. Overnight at Lodge. Today early morning we trail along the chilly winds towards Kalpathar. En-route enjoy breathtaking views of peaks including Khumbutse, Lingtren, and Changtse to the east. 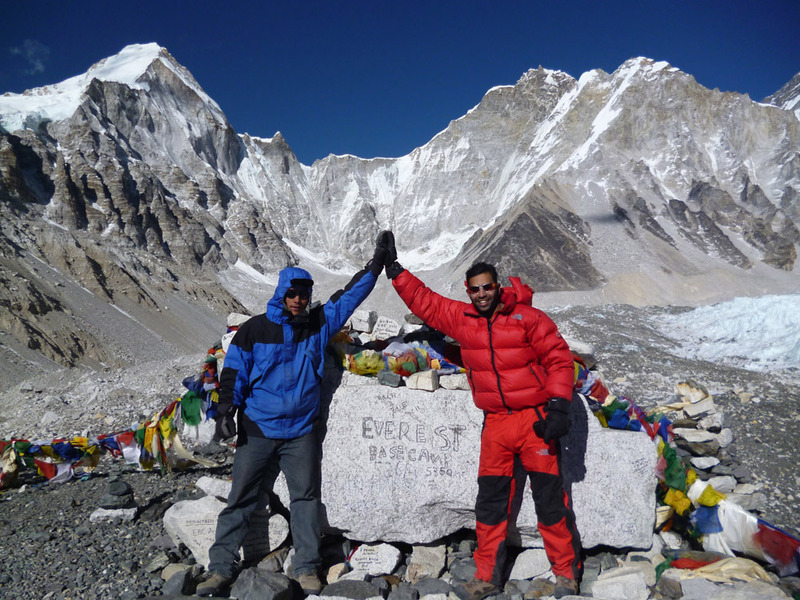 Reach Kalapatthar (5,545m/18,192ft) and here you will be amazed by the 360-degree up-close and grand panoramas of Mt. Everest. Enjoy the never before views and take some pictures then we trek down to Pheriche. overnight at lodge. From today we have easy and pleasant trek heading down to lower altitudes. Reach the ridge, trail along the stream and towards Pheriche valley. Trekking further down the slope to land at Namche Bazaar.overnight at Lodge. After breakfast, we retrace the same trail as earlier to reach Phakding. overnight at Lodge. Today again pass through lush green forests to reach Lukla, our last destination of trek. Relax on reaching Lukla. Overnight at the hotel. After breakfast, we board an early morning flight for Kathmandu. On reaching rest or do some shopping. You can also explore the famous tourist places of Kathmandu. 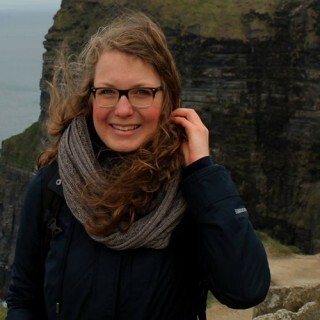 Our tour representative can help you with sightseeing.overnight at the hotel. Today our tour representative will transfer you to the Kathmandu Airport for the flight back to home with worthwhile memories. From Kathmandu - Lukla - Kathmandu flight may be delayed by few hours or even canceled due to bad weather condition. So, you should be prepared for such flight delays or cancellations. But we will do our best to avoid such conditions. In case of flight cancellation, we will try to get you on the flight for the next day. Getting early flight for the next day may not be possible during the high season so, we can arrange flight by helicopter as well but it will be an extra cost. If we have a group of 4- 5 people, we can charter a helicopter from Kathmandu – Lukla. It will be advisable to have extra days in Kathmandu before and after the trekking. We can arrange you cultural / adventure tours (such as sightseeing tours, rafting, jungle safari, with extra cost if the extra days are not used for the flight conditions to Lukla and back. Trip of a LIFETIME with Halesi Treks! Great organisation and support from Man Kumar and his team! They will do everything do make your tailor made trip to and around Nepal possible. They are really flexible, the groups are small (for us it was just my dad and me!) and you don’t need to worry about anything. Thanks to Man and Tek we had such a memorable and great three weeks in Nepal. Thank you again! I would like this trip was an unforgettable moment for me. It was amazing journey with many memories along the way. Fun, laugh, meeting new friends, getting to know the local. Things that i never experience it before. Man kumar was our personal guide. We went a group of four with 2 porters.